I finally posted up this piece - it's a collaboration between me and my friend Kate Guillen that we did for our GR2 show, Diplopia. Kate did the beautiful other-worldly scenery; I painted the people in a surreal week and a half visiting my folks in Tucson, only days before the show opened in LA. Taking Kate's artworks and free-handing on top of them felt insane. But now it's one of my favorite things I've ever worked on - getting to make art with Kate was so wonderful. The paintings are for sale here. ^An initial concept sketch drawn on cash register tape. 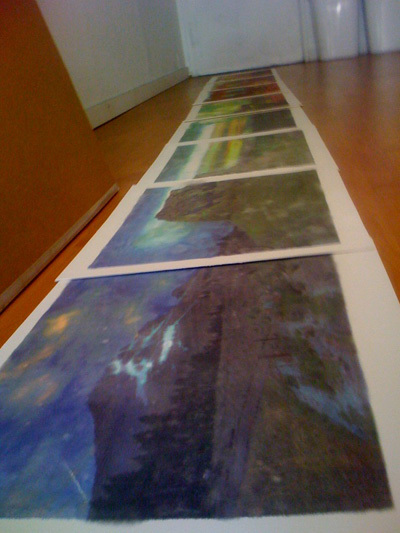 ^A mid-process photo of Kate's landscapes. Being silly with perspective: this is a giant (4.5'? 5'?) collaborative wall piece we did over the final sleepless night before the show. There is a strange corner in GR2 above the register where the wall juts out about three feet. 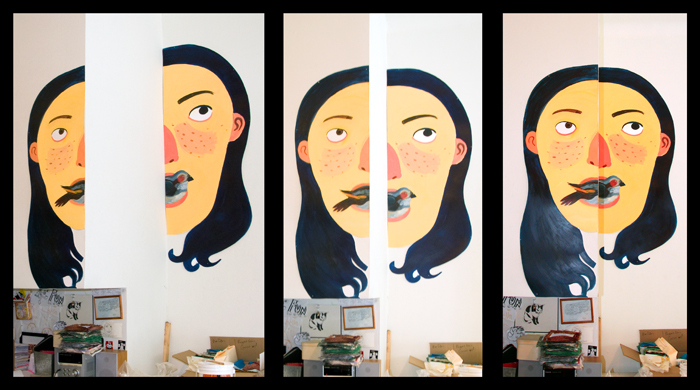 We painted half of a giant head and put it on the back wall, and the other half a third smaller and put it on the near wall. If you stood in an exact spot right in front of them they'd line up perfectly. This would have been easy to make with a computer and printer, or even a overhead projector, but we free-handed it: it didn't deserve to come out as well as it did. I'm still not sure if this actually seemed as cool to other people as it did to us (maybe just to me?). 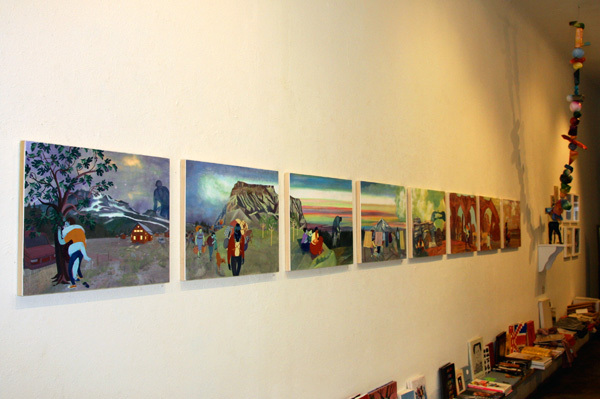 Hey it is really cool to see all those paintings up together. And big. With the zoom. They're good. Paintings. Oh, I wish, I wish, I wish I had seen this sooner. I want the laundry painting to be mine. In the meantime, good luck with your prints! Thank you, Carrie! That was actually the first one that sold, I guess it is a favorite!